The Weirdstone of Brisingamen and The Moon of Gomrath, by Alan Garner – These two books take place in and around Alderley Edge in Cheshire, where Garner grew up. 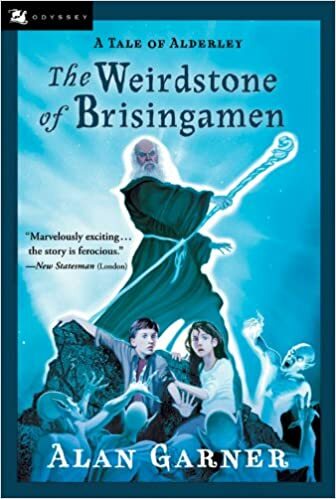 Twin children named Colin and Susan come to stay there, and it’s revealed that Susan has come into possession of the titular Weirdstone. The two ally themselves with the wizard Cadellin Silverbrow and some dwarves against the dark elves and other evil beings. Quite a few elements of Norse and British mythology are incorporated into the story, as well as a local legend about warriors who were sleeping until danger came to England. In the second book, Susan is possessed by a malevolent spirit. What’s weird is that, while I liked reading the books, I couldn’t really tell you much of what happened in them. That’s sometimes the case for me, although I don’t know why. I understand there was a third book in the series published in 2012, almost fifty years after Gomrath, but the Brooklyn Public Library doesn’t have it. 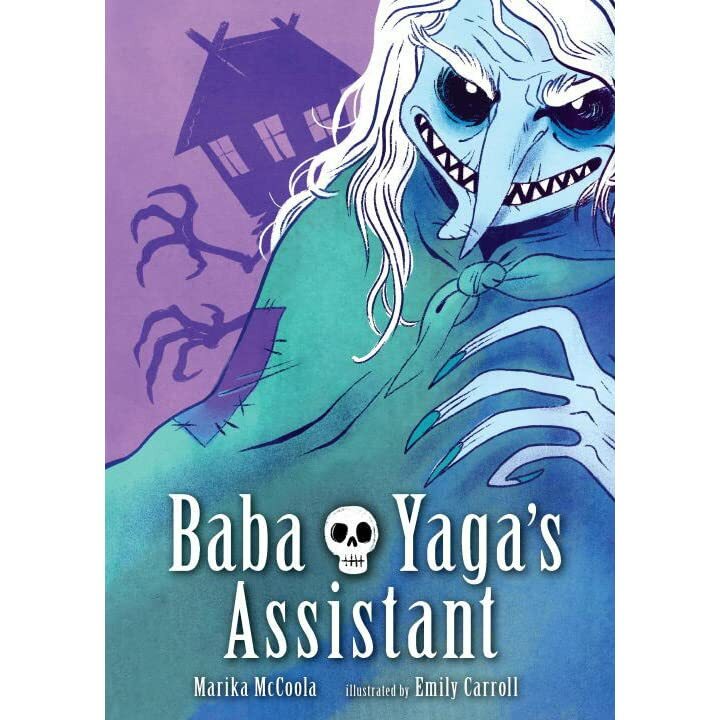 Baba Yaga’s Assistant, by Marika McCoola and Emily Carroll – In this picture book, a girl named Masha answers a want ad from the legendary witch. Fortunately, she knows the classic Baba Yaga stories through her grandmother, who had apparently visited the witch at some point. Baba Yaga is a somewhat ambivalent character, who sometimes eats children and sometimes helps them. The book emphasized that she’s someone who respects anyone clever and persistent, even if they thwart her plans. I think this would be a good introduction to Baba Yaga for kids, but what do I really know of children? A Voyage to Cackogallinia, by Captain Samuel Brunt – The popularity of Gulliver’s Travels led to quite a few imitators, including this tale of an English sailor who visits a country inhabited by chickens. The satire mostly involves economic conditions at the time; an introduction by Marjorie Nicolson to the copy I read explains about the rise of credit and the South Sea Bubble (something that was sort of repeated in the dot-com bubble). The chickens live in a society rife with corruption in which those who achieve higher status literally grow larger and eat the commoners. The story ends with a visit to the Moon as per a scheme to mine gold there, only to find that the place is inhabited by spirits of the dead. Like Gulliver, the book is written in the first person and credited to its protagonist. As far as I know, nobody knows who the actual author was. 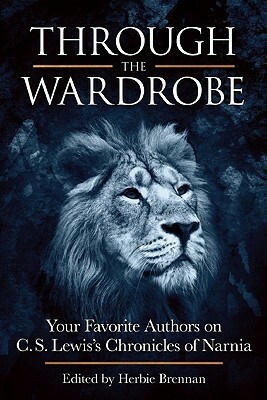 Through the Wardrobe: Your Favorite Authors on C.S. Lewis’s Chronicles of Narnia, edited by Herbie Brennan – The subtitle wasn’t really accurate for me, as the only one of the authors in this collection I’ve read before was Diane Duane, but I still found the essays quite interesting. The theme is basically how Lewis’ themes have managed, for many readers, to transcend its Christian themes. That’s not to say that those aren’t important, just that the books can be enjoyed even if you don’t share Lewis’ faith. There’s a piece about the author having a crush on Edmund, as well as takes on why food was so important to Lewis and his characters (it had to do with wartime rationing), the success of the series’ girl characters, environmental themes, and the much-debated racism with the Calormenes. I’ve been reading quite a bit both pro and con on Lewis and the Chronicles recently, and I find that they both have valid points. The Paper Magician Trilogy, by Charlie M. Holmberg – These three books, The Paper Magician, The Glass Magician, and The Master Magician, take place in a version of England where magic is pretty common, but only works on man-made substances. Ceony Twill is bothered that she’s forced into specializing in paper, but learns that there’s quite a bit that can be done with it, and also falls in love with her older tutor Emery Thane. I believe she even mentions the similarity to Jane Eyre at one point. During her studies, she fights off several villainous magicians, including some whose magic affects human bodies. She finds out that, even though a magician can only bond to one substance at a time, it is possible to switch between them. I can’t say I found the romance all that convincing, but the story was good. From what I’ve read of the author, she owns multiple pairs of glasses, plays the ukulele, and got her start writing Star Trek fanfiction. Sounds pretty twee, no? I understand Disney has bought the movie rights to the series. This entry was posted in Authors, Book Reviews, C.S. Lewis, Chronicles of Narnia, Humor, Magic, Mythology, Norse, Russian, Slavic and tagged a voyage to cackogallinia, alan garner, alderely edge, baba yaga, baba yaga's assistant, captain samuel brunt, charlie holmberg, diane duane, elves, emily carroll, gulliver's travels, herbie brennan, jonathan swift, marika mccoola, marjorie nicolson, the glass magician, the master magician, the moon of gomrath, the paper magician, the weirdstone of brisingamen, through the wardrobe, witches, wizards. Bookmark the permalink. Strange that you cannot remember anything about the weirdstone. one of my most enduring memories from any of the books that I read in childhood was the description of Colin and Susan escaping from the Svart Alfar by crawling down the tiny underground passage in the mine. The description of how the passage narrowed so that they could only move forwards at full stretch with toes and fingers – and then the tunnel dipped underwater – freaked me out bigtime for years afterwards. I have to wonder if it was more my situation when reading it, generally in somewhat loud and uncomfortable places, than Garner’s writing that was to blame for my lack of memory. I do recall that part, though.